Experiments done more than two decades ago on Martian soil collected by the Viking Landers 1 and 2 provided evidence that life might exist on the Red Planet, says Joseph Miller, Ph.D., associate professor in the Department of Cell and Neurobiology at the Keck School of Medicine of the University of Southern California. Miller recently did a re-analysis of data collected by the landers, and found that something in the collected soil was apparently metabolizing nutrients - and doing so with a distinct biological rhythm that, he says, can only be found in a living cell. Miller presented his findings this weekend at an astrobiology symposium held during the International Society for Optical Engineering's 46th Annual Meeting. In August and September of 1975, the Viking spacecraft were launched from Cape Canaveral. After travelling for nearly a year, each reached the atmosphere of Mars and the landers were deployed to the planet's surface. Once there, they performed a series of experiments - including one in which a robotic arm scooped up samples of soil and deposited them in petri dishes, along with a drop of a nutrient solution that had been labeled with radioactive carbon. The idea, explains Miller, was that if there were any living organisms in the sample, they would take up the carbon-labeled nutrients and process them, eventually releasing the radioactive carbon in a gas form. A radiation detector was set up near the covered dish, connected to it by a tube through which any released gases would travel. And travel they did, says Miller. When the data were collected, the original researchers involved with the Viking expedition - Patricia Straat and Gilbert Levin - found definite evidence of gas release. 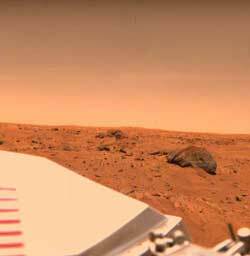 It seemed they had indeed found life on Mars - but other scientists suggested that the release might be better explained as the result of chemical reactions with highly reactive compounds like superoxides and peroxides. Unable to prove that the gas was definitely being released by living organisms, the NASA scientists let the matter drop. And so those tantalizing data sat, more or less undisturbed, until 1999. Miller, who had worked for NASA in the early 1980s, studying the effects of zero gravity on circadian rhythms in squirrel monkeys, began writing a proposal to NASA to do biology on future Mars expeditions. It was then that he saw a figure in a geophysical journal taken from the data from the Viking Lander 2 experiment - a figure that showed highly periodic gas release in Levin and Straat's experiment. "I immediately got interested," says Miller. "So I asked NASA if I could look at the data." It took a number of calls - and a good four months - to uncover what Miller was looking for. And when NASA found it, there was a problem. "The data were on magnetic tapes, and written in a format so old that the programmers who knew it had died," Miller said. Eventually, NASA was able to recover the data from printouts, luckily preserved by Levin and Straat - and so, Miller was able to pore over the numbers. There were a lot of them - in fact, their analysis is still underway. But even after having crunched just 30 percent of the experiment's data, Miller was able to find something remarkable - something, he says, that went unremarked-upon in the original papers. "The signal itself not only had a circadian rhythm," declares Miller, "but it had a precise circadian rhythm of 24.66 hours - which is particularly significant, because it's the length of a Martian day." As for the original concerns of the dubious chemists, who thought the same sort of signal could simply be coming from highly reactive, non-organic compounds in the soil, Miller says such a scenario would be almost impossible to imagine. "For one thing," he explains, "there has since been research that shows that superoxides exposed to an aqueous solution - like the nutrient solution in the experiment - will quickly be destroyed. And yet, the circadian rhythms from the Martian soil persisted for nine straight weeks."